There's a nip in the air this morning. No doubt that Autumn has arrived, and the heating is on. I am going to bore you now, with yet another Christmas card. 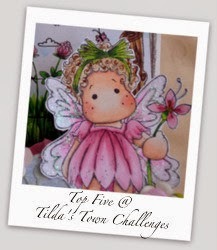 This one uses an older stamp, Tilda with Rudolph. I still use it a lot because it is so cute. She has been painted with distress ink, mounted, and inked on the edges. 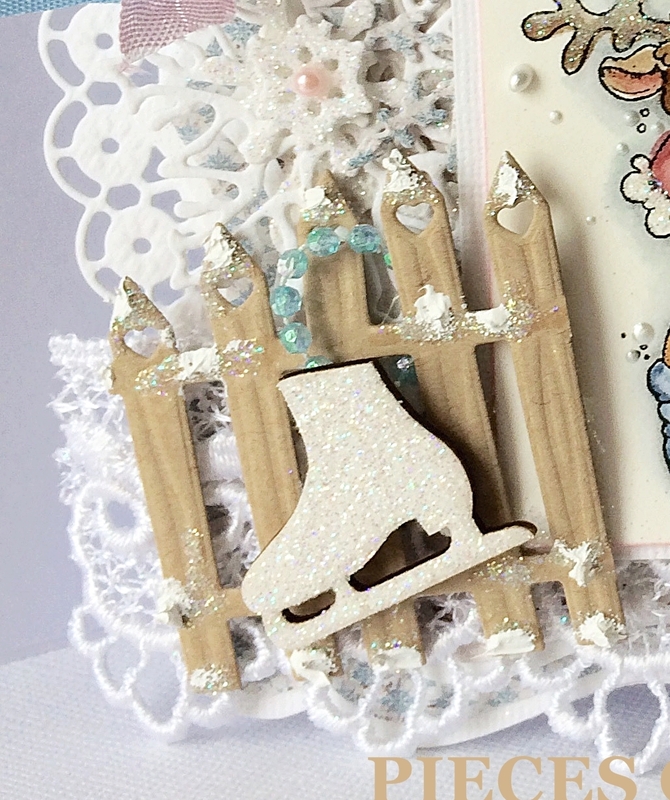 I also glittered some snow flakes and added tiny pearls to the centres. This is a closer view of the image. Glittered hat, trim and Rudolph's tum, but my camera doesn't capture it well. there are so many elements to this card, it's impossible to mention them all. 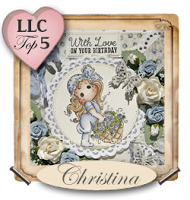 Most of the diecuts are Magnolia and I have used lacy paper doilies in the background. 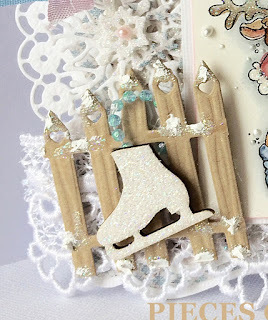 The lace holds a snowy fence from which Tilda's glittery ice-skates hang from beads. And a double bow of seam binding has a diamanté and pearl embellishment. And last of all, here is a picture of the flowers, berries and cones. 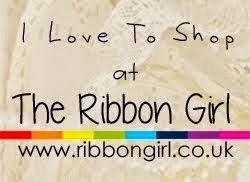 If you visit, please leave me a comment to encourage me. Morning Everyone, here is a card I made last week. Painted with inks on watercolour paper with lots of added sparkle, pearls and diecuts. The circle is Joy Craft and snowflakes and trees are Magnolia. Maja papers were cut with GoKreate dies and have gesso on the edges. 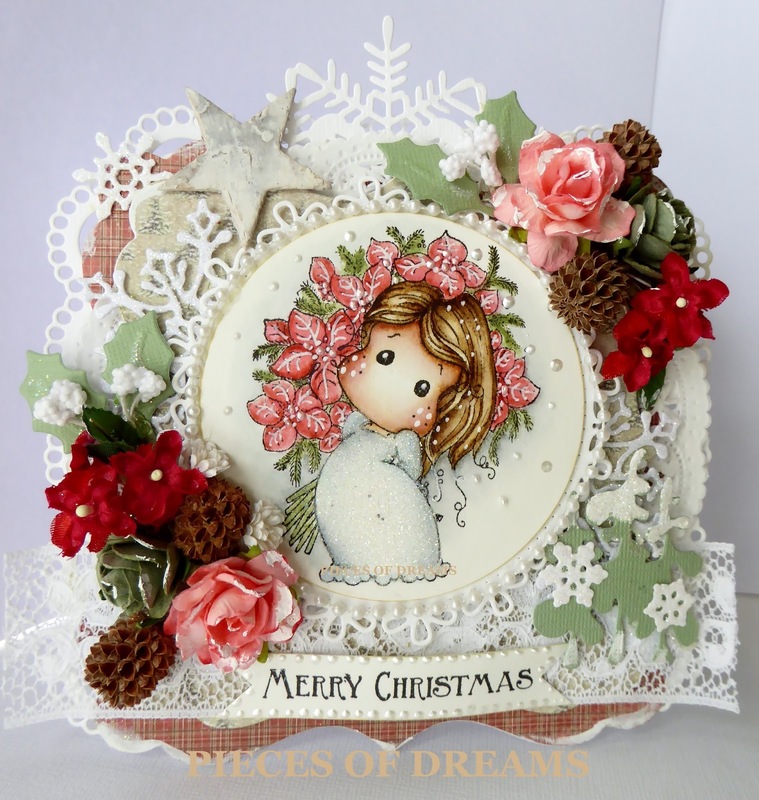 A shabby wooden star,pine cones and flowers decorate. Another Christmas card from me. 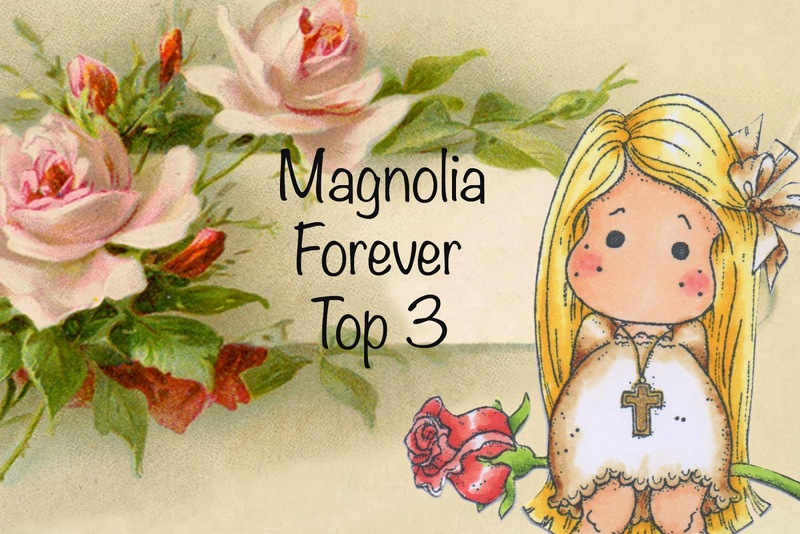 This time using three different Magnolia stamps. Firstly stamping Tilda and her dog, then masking them before stamping the tree. As usual, I painted with distress ink and water. 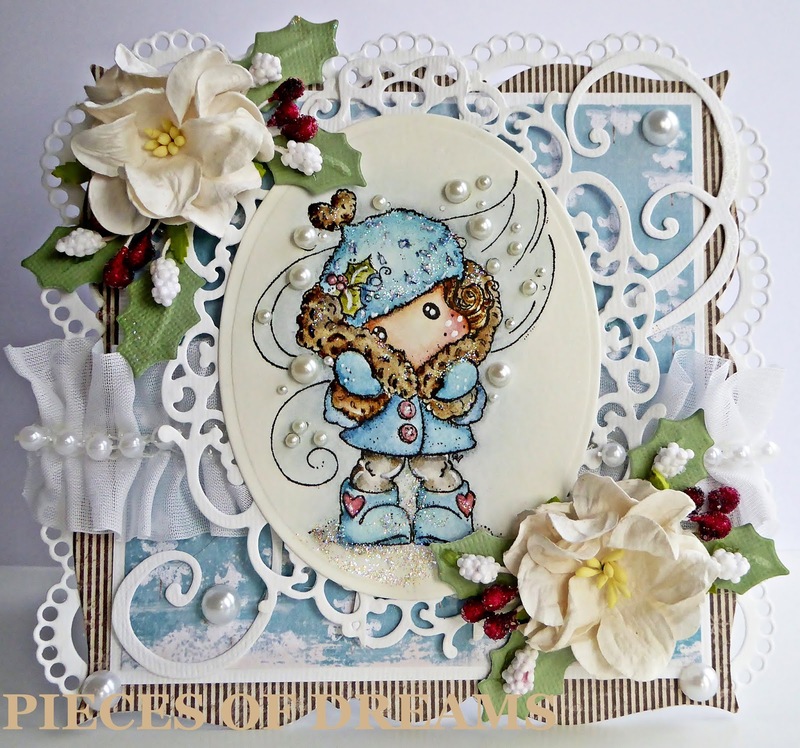 I kept the card square, but layered the Maja paper using white Bazzill card and die cuts. Wide gold ribbon bow holds a sparkly snowflake. Also, pearls, holly leaves, berries and red and white flowers decorate the corners. Just for a change, I've used Magnolia paper and matched the ink by blending. She is painted in inks and Glamour Dust has been sprinkled at her feet and her hat. 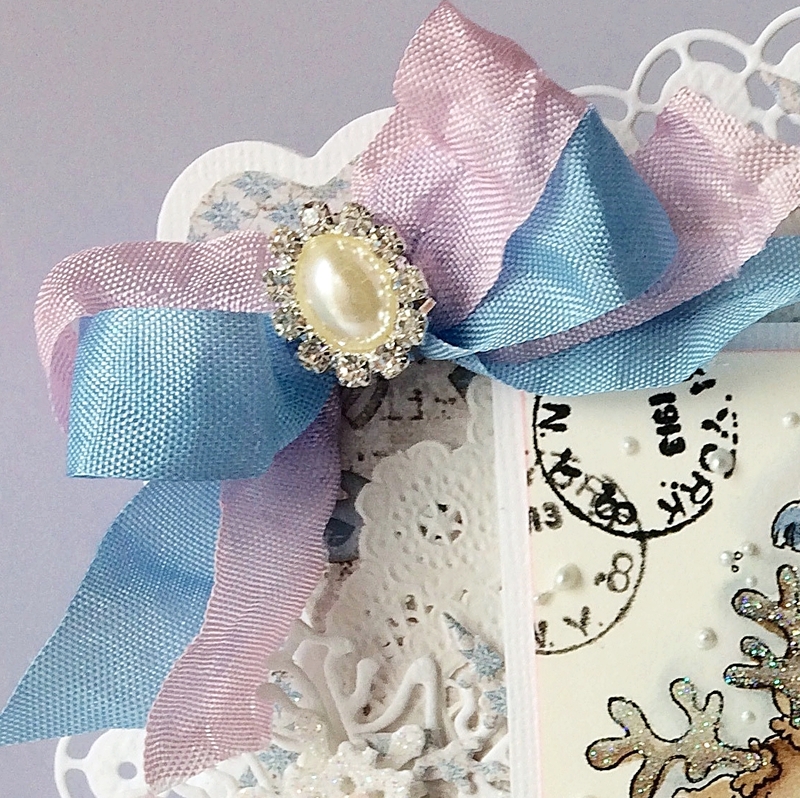 Always use Bazzill textured cardstock for both card and die cuts. It gives a stronger, more professional look. 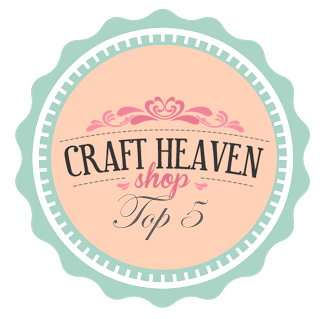 Swirls are Magnolia dies, others are Joy Craft. Added pearls for snow, and frilly lace is from my collection....which I love to stroke, and hate to use. Hope you like this one and see you soon friends. Its for sale on Ebay if you want to buy it. Long time no post ! The last time I used my blog was May 2016. I've had a rough year or so, but I'm now ready to post my cards again. Due to the constant encouragement of my friends. I'm doing this on my phone, so we'll see how it works out. 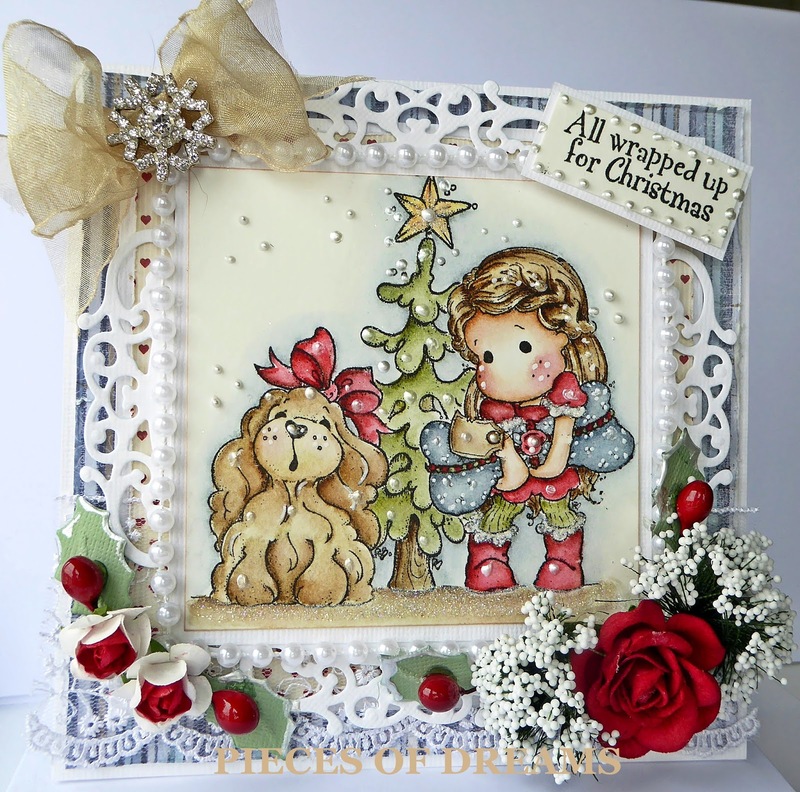 The papers are by Maja Designs. Two different collections actually, and that's what I like about Maja. The colours always mix and match, and tone beautifully with distress inks. I cut the card using Go Kreate dies and added border dies. The pretty top one is Joy Craft, use it a lot. Rose leaves are made with a Magnolia die. 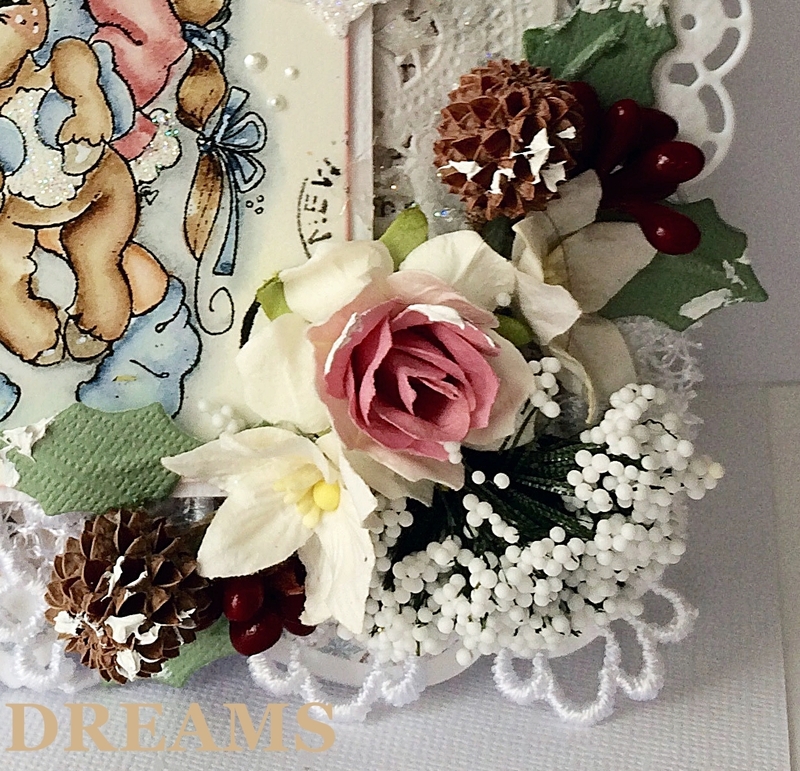 The flowers are mainly from Wild Orchid and lace/ribbon from my stash. 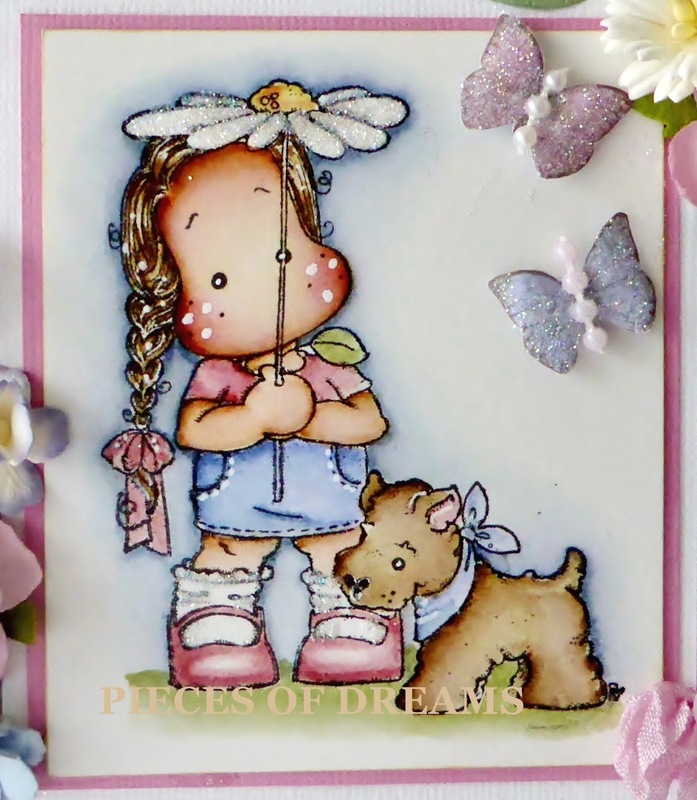 I masked my stamp and added this cute little dog. It's for sale on eBay until Saturday evening.